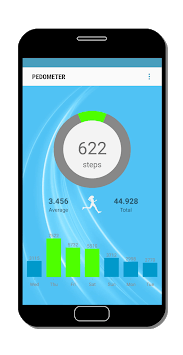 The free and accurate pedometer walking app. Exercise is important for good health. Walking or running is a good way to get moving. It is recommended to walk at least 10,000 steps daily. This way you keep moving and stay healthy and in shape. You also keep your fitness level. Unlike many other pedometer apps, this free pedometer app uses the hardware step sensor of your mobile phone. In this way the number of steps can be displayed very accurately. This also applies to the distance traveled. This free pedometer app does not use the movement of your mobile phone or your location. Using the hardware step sensor ensures that the use of your battery is very low. This app is suitable for both walking and running. It is recommended to set the pedometer for the first use. Determine your personal daily goal and indicate how many steps you want to walk each day. 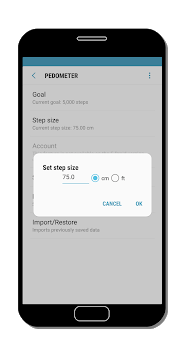 You can also set the step size. This ensures a good display of your distance traveled. So start moving and working on your fitness with this walking app. Get in shape and complete 10,000 steps daily. Rate this pedometer if you are satisfied or if you have advice for improving the app. Your response will always be processed.